It’s been a busy fall – Zach is all married-off now (great wedding, lots of music and dancing!!!) to Hollie and we’ve been getting the garden harvested, wood cut, cider pressed, porch closed in, guitars made, and music played….been raining non-stop forever, and we know what’s next….the snow flies! But before that (hopefully) there are some upcoming tours and gigs and events that we wanted to let you know about. 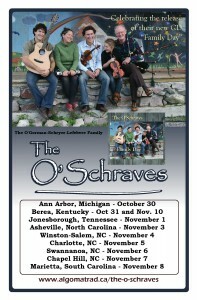 The O’Schraves are heading out on the road, and going due south with house concerts and dances from Michigan through Kentucky, to Tennessee then into North Carolina and touching a bit in South Carolina. Most of the gigs are contradances (7 of them) but we will be doing 3 house concerts as well, one in Ann Arbor, MI on Thursday, October 30, one in Chapel Hill, NC on Friday, November 7, and one in Berea, KY on Monday, November 10 on our way home. Dances are in Berea KY, Jonesborough TN, Asheville NC, Winston-Salem NC, Charlotte NC, Swannanoa NC, and Marietta SC. If you want to know where we will be, click on the poster to download a pdf of the tour itinerary. 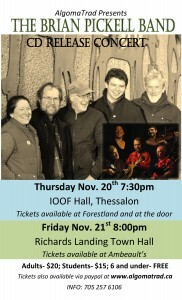 The Brian Pickell Band (Brian Pickell, Shane Cook, James Stephens, Julie Schryer and Patrick O’Gorman) continue to celebrate the release of their 2014 CD “Waves” with 4 concerts: AlgomaTrad presents the band on Thursday, Nov. 20 in Thessalon and Friday, November 21 in Richards Landing; The Strawhouse Gallery presents the group on Saturday, Nov. 22 in McKellar (near Parry Sound) and the final concert is on Sunday, Nov. 23 at the Tranzac in Toronto. Click on the poster to get more info about all four of these concerts. If you want to purchase tickets on-line for the Thessalon or Richards Landing shows, click on Buy Tickets in the left hand column. 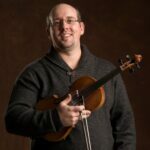 Fiddleworks present a benefit house concert for a local community member fallen on hard times in Chelmsford, Ontario (near Sudbury) featuring the incredibly talented “2014 Canadian Grand Master Fiddle Champion” Paul Lemelin, piano accompanist extraordinaire Melika Lemelin, and friends! Come and join the Lemelins and friends on Saturday November 1st in the comfort of the Lemelin home for an evening of great music. Tickets are 20$ per person. Only 50 tickets will be sold for this event, please call 705-618- PAUL (7285) for further details and to reserve your tickets! The Newlyweds, Zach and Holly, cuttin’ the rug and showin’ how it’s done! CONTRA DANCE in Toronto this Saturday, with one of the hottest dance bands in the world: “Ladies’ Chain” (Benoit, Eli Howard and Colin Savoie-Levac). 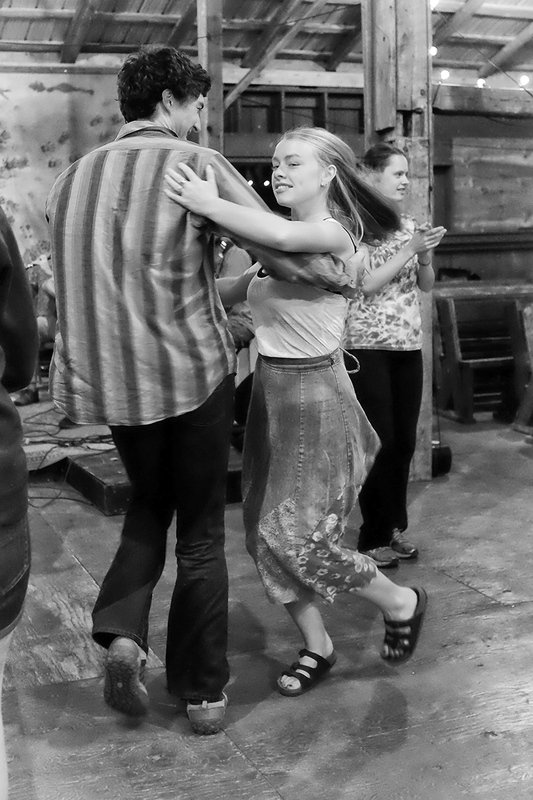 7pm – Toronto Country Dancers Contradance at the St. Barnabas Church Hall, Southeast corner of Hampton & Danforth. More info click here. ALGOMATRAD DANCES in Algoma coming up: Saturday, Dec. 6, Sault Ste. Marie. (tentative) details to come soon… and Friday, January 2 in Richards Landing at the Legion Hall (7:30 workshop for beginners, dance 8:00PM) Adults: $10, Students: $7. Children under 10 are welcome at no cost. CONTRADANCE IN TORONTO’S WEST END – Julia Bennett has started a new series of dance on the second Thursday of the month. 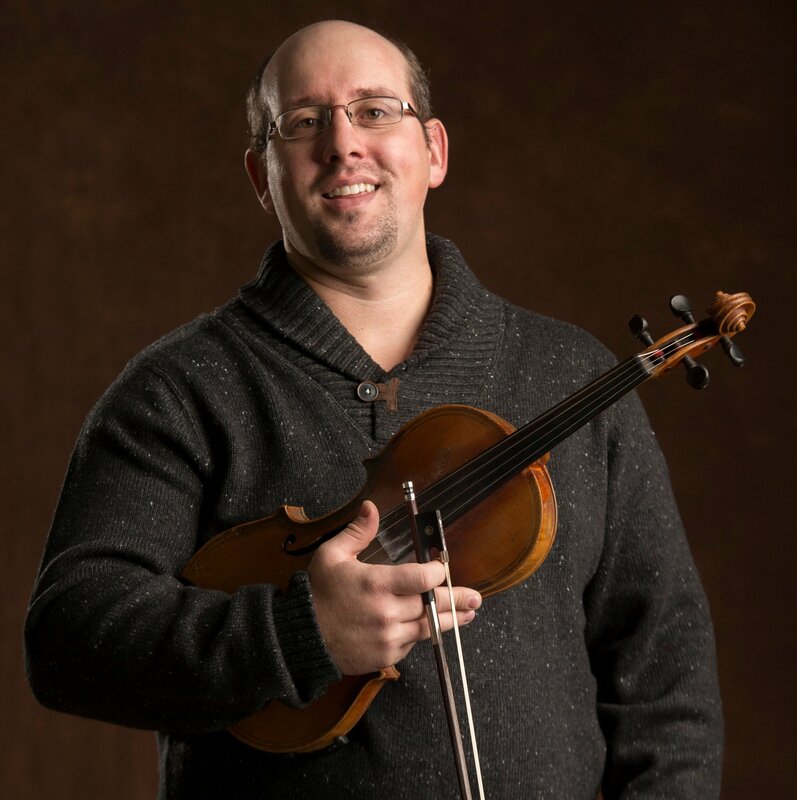 They will features new callers and various musicians – 156 Roncesvalles, St. Casimir’s Church Hall, 8-10pm. Text 647-889-4012 for info. We have had the privilege of spending time with one of Canada’s foremost artists in McKellar over the last several years (next door to the Strawhouse Gallery in McKellar). 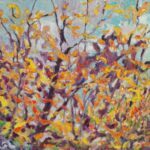 Bert Weir’s paintings are being exhibited in Toronto – if you can make it out to the opening, you will be most inspired to meet Bert and his family. Bert is 90 years of age now, and is an incredible artist and great character. 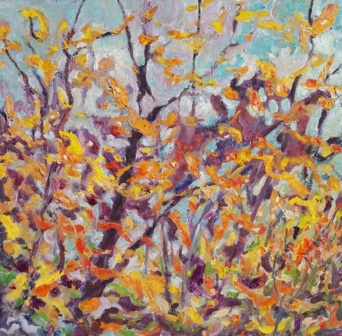 This is a major exhibit featuring the paintings of Bert Weir in four areas of the Evergreen Centre, Toronto. The show includes works from the 1950s to 2014 and is showing until August 2015. You are invited to the opening November 7, 7-9 pm. Bert expects to be there, health permitting, and looks forward to seeing many old friends. You can find out more info about the show by clicking here and here.